This match is a bit tricky. When one of the most emotional signs falls in love with one of the most emotionally detached signs, it is clear that this is going to be a struggle. Scorpio and Aquarius have a natural chemistry that brings them together. Scorpio admires Aquarius’ intelligence and Aquarius, in turn, admires Scorpio’s inner strength; however, with little common ground in terms of emotional connections, this Scorpio-Aquarius relationship is bound to experience a lot of turbulence during take-off, if it even takes off at all. Scorpio and Aquarius are both fixed signs; with Scorpio being of the water element and Aquarius of air. They have character traits that are not traditionally compatible, and the outcome of Scorpio-Aquarius relationships can sometimes be very unpredictable. The Scorpio Male: Underneath his cold exterior, the Scorpio man is very sensitive and feels lonely and unfulfilled. However, often times he will not let his partner know this. He is also jealous, possessive, passionate and intense. He craves intimacy. The Aquarius Male: The Aquarius male is all about intellect. He craves intellectual stimulation and often has many intellectual pursuits. He can be aloof and seem emotionally distant. Deep inside, however, he craves love and intimacy; he just has difficulty understanding and expressing emotion. The Aquarius Female: She is the quintessential independent woman. The Aquarius woman is smart, funny, adventurous, never clingy or jealous, never demanding or overly emotional. She is unpredictable and craves excitement. She does not get emotionally involved easily; however, when she does, she is amazingly loyal and kindhearted. Scorpio demands an emotional commitment; this is at odds with Aquarius’ love of freedom. 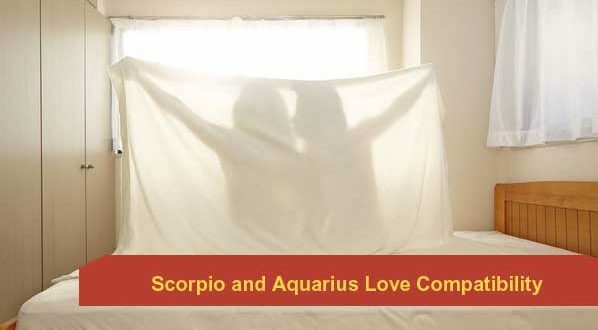 A Scorpio-Aquarius relationship is simply a case of opposites attracting although these two signs are not exactly opposite in the zodiac. Their main differences lie in the fact that Aquarius is intellectually-oriented while Scorpio is emotionally-oriented and as a result, there is bound to be a lot of conflict and disagreements. During arguments, The Intellectual Aquarian is bound to say something blunt that emotional Scorpio will find very difficult to forgive later. Of course, this can only lead to another episode of Scorpio’s Revenge and a vicious cycle will result.